Weekend came and I was ready to go on Friday night, the bag was packed with a change of clothes and my new angle grinder ready to rock. Saturday morning and with Mustang Maniac just over the hour away, the aircon was on, the shades were on and I was on my way. The trip was peaceful for a change and I seemed to go all the way there without stopping. I got out the car and the heat was getting hotter. Adam was being escorted by a couple of his dogs as usual, no sooner had he opened up the steady stream of customers arrived. I saw myself to my car and got straight to work. Yogi (Al) had been busy again welding up the last parts of the underside and the front right shock tower. He had again done some nice welding with the spot welds that I decided to keep them. The top of the shock tower needs to be flat ready for the export brace to be fitted so they were ground down, a little filler applied and painted. The underside had been exposed since the day I removed everything I could of the under seal. There was a little surface rust still and the odd bit of under seal. I started rubbing down with the angle grinder and wire wheel to nice a bare metal ready for the red oxide primer. This last little section was taking a lot longer due to the complex shapes for the rear shocks and suspension mounts. The tufts of wire wool ( if that is the technical term for it) was difficult to work with, trying to get in all the corners that the grinder wouldn’t fit. The manual work had made my fingers and wrists ache. But it was worth it. This time I took a part way picture. 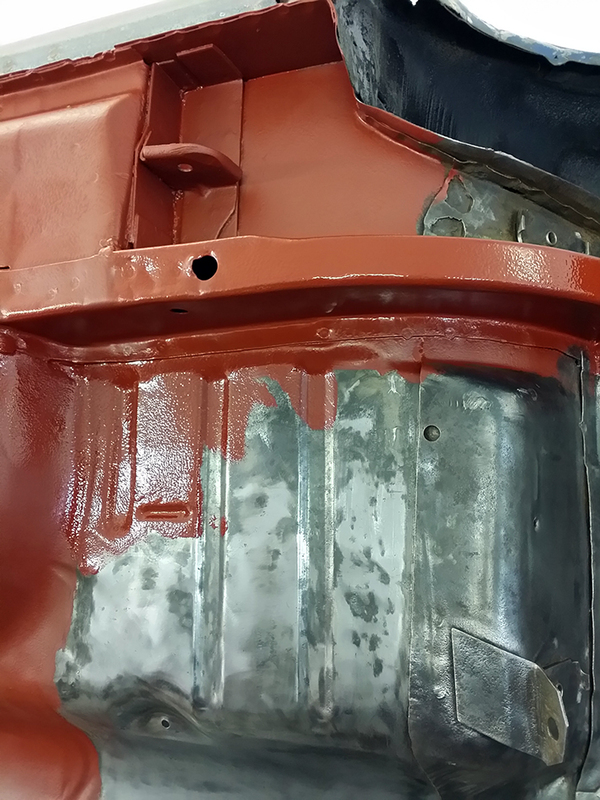 With all the red oxide primer done for now the difference is amazing. I finished at the point where some of the thin metal will be removed and replaced at a later date. You will notice a couple of little spots haven’t been painted as they need a couple of spot welds. With a little luck and man power available, the car should be taken off the spit and clamped on the jig getting ready for some upper body work. Then I suspect there will be more under body painting before she goes to the proper paint shop. Sunday was a day tidying up in the man cave, the localised tornado that hit my shed on Saturday while I was out just happened to have the same name as my wife! I also cleaned a little more on the steering rack, and the photos looked no different to the previous pictures unfortunately. So I didn’t post those ones for wanting to look like duplicates. I am planning on doing a review of my new Makita GA4530KD if anybody is interested. This entry was posted in General, Photo's and tagged angle grinder, Makita, man cave, Mustang, One man and his Mustang, red oxide primer, rust, shock tower, welding. Bookmark the permalink.